During school holidays I take a break from doing an extensive weekly prep session. As much as I love routines and plans it is nice to have break, go a little off grid, then come back re-energised and recharged for the new term. To save me some time this month with the menu plans, I just went back to April last year and am using those plans! This truly is the beauty of menu planning. Within five minutes and very little thinking I now have four weekly menu plans to get us through April. While the kids weren’t involved in this process, they were involved in choosing the meals this time last year and their preferences haven’t changed too much so their favourites are all included. Getting kids involved with menu planning is one of the best ways to stop the whining and complaining that can come along with meal time. Our kids get to select a number of meals for the month and while they may not love every meal that is served up that week, there is generally at least one of their favourites. The kids can check the menu plan out which I have on the fridge and it allows them to adapt better to what we are having for dinner not only on the day they are looking, but they can see the bigger picture of the whole week’s worth of meals. You can see my full menu planning process and download free templates here. To make my weekdays easier for many years I have spent time in the kitchen on the weekends prepping and cooking food for the week. During the school term I share photos and links of the recipes I cook up during my weekly food prep sessions on facebook using the hashtag #pwkweeklyprep which you can see here. I know spending time in the kitchen isn’t everyone’s idea of good time, but I actually like spending the time in the kitchen, so don’t find it too much of chore. Even if you don’t want to do the extensive type of food prep I do, it is so beneficial to at least make a couple of things to make your life easier during the week. Many women who have joined my Planned + Present E-course now do weekly food prep sessions and while they may not love the cooking, they love the impact it – easier mornings and happier meal times through out the week. Below I have included a few ideas that you could make in a weekend. As a base I encourage parents to make one savoury or main lunch box item and a sweet treat or snack item for the kids’ lunch boxes. This really takes the pressure of making the lunches during the week. Sweet chilli chicken wraps – make a double batch, some for dinner and some for kids to take in wraps for their lunches. 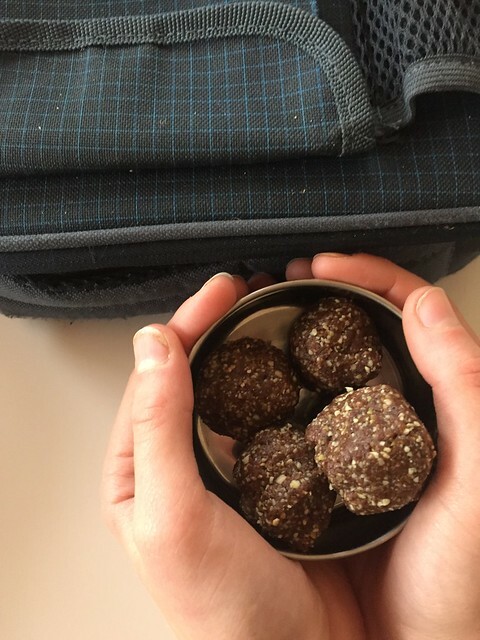 Nut free choc peppermint balls – With essential peppermint oil, these balls are a minty delight! Nut free, gluten free, dairy free and refined sugar free they are also allergy friendly and work well as a small sweet treat for the school lunch box. Gluten free hamburgers – my kids love hamburgers, so will happily have them for dinner, then cold in their lunch box, either on their own or in a roll with salad. Choc banana muffins (gluten, dairy and nut free) – Lovely moist choc banana muffins that are gluten, dairy, nut and cane sugar free Perfect treat for the kids lunch boxes or a snack for mum. Sushi – I am always asked about how long this lasts and my kids eat it until mid week. If you read storage recommendations from here though it says to eat it within 24 hours. Butter Cake Recipe – Butter cake recipe based on the Donna Hay classic, this cake is perfect for lunch boxes or birthday cakes. Best of all it is a one bowl wonder! Simple and family friendly is the key for our family menu plans!